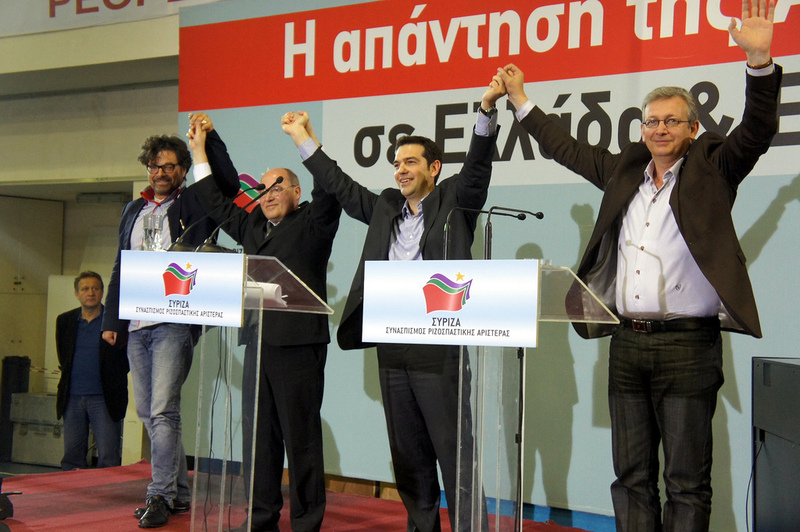 SYRIZA's radical left is the first party in Greece, but does not break through. The conservatives of New Democracy suffered a clear defeat, but limit the damage thanks to the non-collapse of the government's "junior partner", the socialist PASOK. The results of the European elections show Greece in the middle of the ford, "stuck in the long tunnel of political transition", as writes journalist Nick Malkoutzis in a sharp editorial. A tunnel where the neo-Nazis of Golden Dawn send three representatives to Brussels. Alexis Tsipras, leader of SYRIZA (and candidate for the European left to the chair of President of the European Commission) presented his reflections on the vote on Sunday, May 25th, after a meeting with president Karolos Papoulias. For Tsipras, the victory of SYRIZA shows a fracture between the current parliament (elected in June 2012) and the popular will – a fracture resulted from the decision to reject the austerity measures imposed to Athens by international lenders, and that can be remedied only by early elections "to be held as soon as possible". "This government has lost all legitimacy to impose further austerity policies to Greek citizens", added Tsipras. The demand for early elections was immediately rejected by the government. For the conservative prime minister Antonis Samaras, the sharp decline in votes of his New Democracy (7% less than in the 2012 political elections) is not reason enough to call voters to new consultations. According to Samaras, the percentage of votes obtained by the two government partners (New Democracy and PASOK) still exceeds SYRIZA's. A result due to the unexpected resilience of the socialists, who presented under the new symbol of the "Olive Tree" (Elijah) and were able to get the 8% – which marks another haemorrhage of votes, but exorcises, at least for the moment, the prospect of total liquefaction for the political parties that were dominant in Greece before the crisis. The signal of voter discontent, however, is loud and clear and the government cannot turn a blind eye. That is why, in the corridors of power in Athens, insistent rumours evoke a "brave" government reshuffle, to be carried out as soon as possible. Among the ministers at risk, Yannis Stournaras (Finance), Adonis Georgiadis (Healthcare), and Aris Spiliotopoulos (Labour). At the moment, the prospect of new elections seems unlikely, at least until the election of the next President of the Republic, expected in February 2015. Then, numbers on the table, SYRIZA could block the process and force the majority to dissolve parliament. Until then, all political forces are called upon to make difficult choices in the management of the outcome of European elections. For SYRIZA, the challenge is to convince voters that the radical left is ready to govern Greece. At the European elections, Tsipras' party obtained the same percentage of the 2012 political elections (ranking first thanks to the sharp decline of New Democracy), a figure that shows SYRIZA's difficulty in further expanding its electorate. A decisive answer could come from Attica, the region that includes the capital Athens and where almost half of the Greek population lives, conquered last Sunday by SYRIZA candidate Rena Dourou (on May 25th, European elections were grouped with the second round of administrative elections). Good results in the local administration could convince many voters of the maturity of SYRIZA. A disappointment, instead, may permanently block the party's growth. The next few months will be even more complex for New Democracy. The right turn Samaras proposed to the party did not prevent the growing distrust of the electorate and the loss of votes to Golden Dawn and a revived LAOS (Popular Orthodox Grouping). The Samaras government has to deal with the many chapters of an always dramatic economic situation. Despite the slowing down of the economy's decline (-1.1 % in the first quarter of 2014) and estimates hoping for a slight recovery at the end of the year (+0.6 %), the total collapse of the last six years (-25.6%) left the Greek economy in a state of prostration. Unemployment remains very high – 26.5% in February 2014, one million three hundred thousand people. In this difficult context, the government has to manage the austerity plan agreed with international creditors and increasingly unpopular with the Greek electorate. The "troika"'s (EU-ECB-IMF) next visit to Athens is scheduled for next July: on the table will be thorny chapters, including a new reform of the pension system and the continuation of structural reforms. With 8% of the votes, PASOK managed to avoid the final disappearance from the Greek political landscape. A partial victory for socialist leader Evangelos Venizelos, but yet another sharp decline (-4% compared to the meagre results of the 2012 political elections). PASOK, the undisputed leader of the Greek political scene pre-crisis (in 2009 it obtained 44 % of the votes), seems today to be missing primarily a long-term vision, the ability to renew and redefine its role in the new, post-austerity Greece. The crisis of the centre-left, bypassed and replaced by more radical SYRIZA, is confirmed by the electoral disaster of the Democratic Left (DIMAR) of Fotis Kouvelis, a former partner of the government, relegated to the margins with a measly 1.23%. At the opposite extreme of the political spectrum, a clear winner emerges in the form of neo-Nazi movement "Golden Dawn", which became the third political force with 9.4%. A result achieved in spite of the fact that a good part of the leadership, including secretary Nikólaos Michaloliákos, is currently in jail for violent crimes and criminal conspiracy. Golden Dawn is the only political movement which indisputably expanded its electorate in comparison with the 2012 political elections (6.9%), especially growing in large metropolitan areas, including Athens. In addition, the analyses of the vote show a strong, growing support for Golden Dawn in sensitive categories such as law enforcement. In the next European parliament, Golden Dawn will be represented by three MEPs, representing the most extreme and violent opposition to the founding values of the European Union.